Delta Air Lines is having what might possibly be the most-popular job search in a long time: More than 100,000 people have applied for just 1,000 openings as flight attendants. Part of the reason behind the huge turnout might be the nation's persistently high unemployment rate, but the airline says that a lot of people just want to fly. "I realized that I didn't want to be in an office 9 to 5," said Jordan Leonard, a flight attendant who has worked 20 years for Delta and now also helps with hiring. "I'm about to go all around the world; Europe, South America, Asia. You name it, I've probably been there." And it's exactly that international focus that Delta is seeking. U.S. airlines have finally returned to profitability, in part by cutting flights. Some of those flights are returning now but more importantly Delta is making an aggressive push into new, more-lucrative international routes. And that's really where most of these 1,000 new flight attendant jobs come in. But the job isn't all about sunshine and faraway beaches. It was just a few months ago when JetBlue flight attendant -- now former flight attendant -- Steven Slater made his brash emergency chute exit after having a stressful flight. 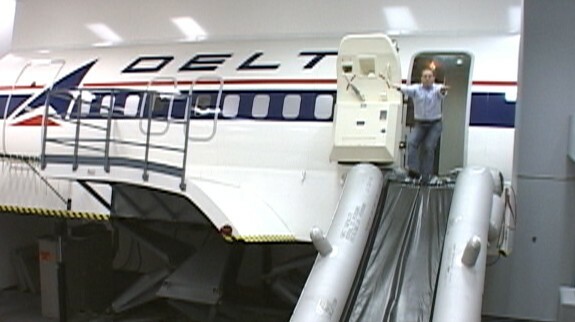 Delta recently let ABC News watch a day of its hiring and also participate in just a small part of the intensive seven-week flight attendant training program that new hires must undergo at the airline's world headquarters, adjacent to Hartsfield-Jackson Atlanta International Airport. And yes, there are lessons on how to use the emergency chutes. But getting there isn't so enjoyable. First trainees have to sit through a flight simulator where the airplane cabin shakes, rattles and feels like it is falling from the sky. You can feel your stomach in your throat. Then alarms go off, smoke fills the cabin and a computerized voice tells everybody to evacuate. It is a stark reminder that flight attendants aren't on planes just to serve peanuts and soda. There are also lessons on fire extinguishers, rafts and opening and closing doors. Flight attendants have to memorize all those wacky three-letter airport codes, are taught first aid and CPR and then more mundane skills, such as learning how to work the airline's scheduling system. Hey, if you don't have a crew, the plane can't leave the gate. There are also informal training sessions on such things as how to find housing. Most flight attendants either commute to their base airport or spend a few nights in cramped communal apartments, given the unfortunate name "crash pads." Hint, start out at CrashPads.com, a sort of Craigslist for flight attendant housing. So why so many hires? Lengthy international flights are on big jets and require larger crews. But Delta also wants to offer a higher level of service than its competitors -- well, at least in the front of the plane. The airline is seeking foreign language speaking crew members who can cater to business travelers who might pay $6,000 or more for a first class ticket between New York and Rome. Speaking a foreign language is not a requirement for the job, but it sure helps. "Twenty years ago, when I got hired, a language was not a necessity," Leonard said. "Is it a plus today? Absolutely. Look at everywhere around the world we go." The real key to getting to wear the Delta uniform is personality. "One of the attributes of a Delta flight attendant is that you are able to manage conflict; that you are able to work as a team. You have to deal with difficult situations as well as difficult people all with that graciousness in the heart," said Cathy Donaldson, who has worked as a flight attendant for 39 years and also assists in hiring. "It's not about serving peanuts and Cokes," she said. "It's about making sure that the flight experience for any customer -- from point A to point B -- is one that engages them to the point where they will say: 'I want to fly Delta again.'" In that spirit, Delta tries to make the interview process as much fun as possible. "If these candidates are not successful in becoming Delta flight attendants, we still want them to be Delta customers in the future," Donaldson said. It is still an interview, but the candidates are assigned to seats such as 15C -- it was an aisle seat -- and 17A -- unfortunately, there were no windows in the room. Donaldson starts the day off with a high-energy cheer -- "Hey, hey, hey, hey, you've got your interview today" -- and then in true flight-attendant style tells the candidates to turn all portable electronic devices to the off position and points to all the exits and bathrooms. Delta flight attendants have an average of 20 years of working for the company. So, when hiring, the airline is being picky. Besides, these are the people who spend the most time with passengers and are essentially the public face of Delta. +Free Flights to Vegas, New York and Cancun?